Thank you to everyone who participated in our annual fundraiser! It was a great success! We are so thankful for all walkers (two, three and four legged), volunteers, vendors, sponsors, donors and friends. The event and Norwood Day raffle generated a good amount of money and we are thrilled to have the good fortune to continue our community-based work. 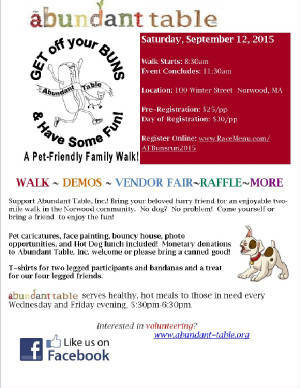 Abundant Table relies on the generosity of its friends and neighbors to continue operation, and events such as this are instrumental in fundraising for that cause. For photos of the event please click on the link below.